In an earlier post, “Where are all the Vickys”, I shared some of the challenges faced here in Sweden regarding making friends. In essence, I explained that the quiet, reserved, and okay with the status quo cultural traits of the Swede makes if quite difficult to start a friendship. Well, having been here a bit longer, things have improved and my family and I have the starting of a few very nice friendships…we hope. We have come to realize that an even larger barrier to making friends is family. At the top you are married with children and tend to only have couple friends with children, especially children of the same age and ideally energy level. Again, we have many excellent exceptions to this hierarchy, but we do see the trend at work, especially now that we are immersed into a new culture and nation. Going beyond this pyramid, we also have K to factor in. K is our oldest boy. He is nearly 3 ½ years old and is big. He is big and aggressive. He is big, aggressive, and easily over-stimulated. I sometimes think of having K is like having a big Rottweiler. 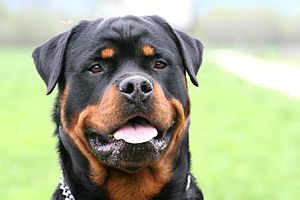 The Rottweiler, more often than not, is just a big sweetie with a huge heart; but they at times don’t quite realize just how big they are and can accidentally break something or hurt someone. K is a bit like that. For the most part he is an incredible sweet and empathetic little boy. But there have been moments where he gets carried away and is this big Rottweiler playing very roughly with a much smaller dog. When we first arrived in Sweden, we met this very nice English chap who invited us over to his home for dinner. He had an 18-month old little girl and his wife was pregnant with their second. Things went very well, we started outside in the garden with some drinks, K and his daughter played well enough, and then we moved inside for dinner and things continued to go well. K was having fun exploring the little girl’s toys and all was good. So a few weeks later, we invite them over to our house to return the favor, really hoping to build a friendship. Now, things were a bit different. Being on his home turf, K was a bit more comfortable and consequentially not on his best behavior. He also missed his nap, which I am sure did not help the situation. As the evening progressed, we quickly saw signs that K was getting overly excited, becoming rougher and rougher, and we tried and tried to calm him down; but in the end, he was running through the hall and delivered an NHL quality full body check to this sweet little girl. And while the parents were very understanding and didn’t seem to hold any resentment for this, the night quickly came to a close and my wife and I have held onto this experience as a lesson learned. K does not play well with others. Another night, we were invited over to another “to be friends” house for dinner, who again had a very sweet 18-month old boy. Things went better than the previous dinner at our house, but at one point in the evening, K had claimed all of this sweet boy’s toys and was barring him from entering his own room. There is another set of “to be friends” that we have made who have a little girl about seven months older than K and a little boy who is six months older than M. And even better than having kids near the same age, K and the girl have the same energy level and the parents are cool and laidback…Jackpot!! Well, we went over to their home and K was wonderful, in fact we had never seem him act so well. He happily set himself the task of discovering and playing with all of their toys and never got over excited or physical. Unfortunately, he also didn’t really play with the girl, which only proved to frustrate her, especially as he started playing with her dollhouse. A bit while later, we had them over to our house. Here, things did not go as smooth. K was possessive and quickly got over excited and physically aggressive. Not good. We ended up plugging him into a movie just so things would not escalate beyond the tears that had already come. Again, the mom was very understanding and unphased by this, but my wife and I are very concerned. How can we really make good friends, if we can’t have anyone over to our house? Again, I sorta feel like that family with the big scary dog that can’t have people over due to the fear of what might happen. Most recently, I have been building a friendship with a very cool Swede that I met playing disc golf. He also has an extraordinarily sweet little girl of about two years. And he issued the long hoped for, and somewhat dreaded invite to his home for brunch. My wife and I went back and forth on this invite. Do we go? Do we all go, or does someone stay home with K? We were very nervous about this; we really want to make friends but is our family in a position to be good friends with? Well, at the very last minute, we decide that we all would go. And the brunch was wonderful. Again, K played with all of the little girl’s toys and even later on in the morning, he was playing with her as well. There were a few moments where I had to ask K to count to twenty and breath to help calm him down; but the morning was actually a huge success. The Swedish couple seems very nice and they have an incredibly cute little girl too. But, how do we return the favor? How do we do our part in showing that we want to be friends and host them at our home, when quite frankly, we are scared about what will happen with K when he is at home? My wife and I have been trying to research about aggressive behavior, fearing ADHD or something similar; but K is too young to be diagnosed. We also just read that no one would diagnose him due to two major life-changing events that he is going through. He has a new baby brother and we moved. One of the distinguishing characteristics of being a nomadic family is that we are nomadic. We move, and we move often. But, this is the first big move we have done since having children. Within six months, K had gained a new brother and lost his entire environment. His whole world has shifted and his aggression, possession of toys, and jealous very well could be his way of coping with these changes; which I completely understand, but how do we make new friends during this coping process? If any of you are also of a nomadic family, I would love to hear your thoughts and experiences as well. Next Next post: Now that’s family friendly!! !